Intercom systems installation service, a full design and installation can be provided for intercoms and access control security systems. We can supply an Install all the leading brands of intercom such as VIDEX, BPT, and BELL SYSTEMS, but in our opinion Videx with outstanding performance and a good track record of reliability they are one of the best electronic door entry manufacturers on the market. Videx offer many systems to suit the end user ranging from basic voice only system to multi apartment digital video systems. 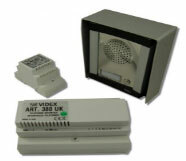 We supply and fit the full range of products available from videx which include DDA compliant audio entry systems which have the compliant settings needed on commercial sites and businesses. If you require an audio or video door entry system then we can design and install a system to you specification, we stock audio, colour video and mono video. All our systems come with a two year parts and installation guarantee. There are many combinations of panel which can be modular in the 4000 series or 8000 series so the panels can be made to specification with extras such as keypad module or prox tag module built in, they come in gold, chrome or steel finish. The 4000 series also comes in a vandal resistant style which is listed below along with the full range of other panels which we supply and fit. 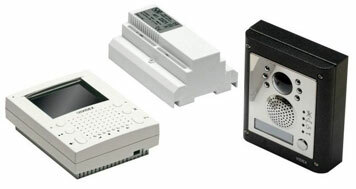 The handsets and video monitors like the one above can be hands free, flush or surface mount and come in a range of styles (as below). GSM intercom systems which are used in situations where cabling is hard to run or not possible, this system works by using the mobile phone network and send a call out to your mobile or land line or both. Then you can release the door or gate by keying in a number on your phone to let in your visitor from anywhere you are. As shown in the panel above it can call either one or more apartments making it suitable for blocks of flats or a gate entry system. The panels can come in many different sizes and styles which include chrome effect, gold effect and steel. The panels can be surface or flush mounted and will all be supplied with vandal resistant screws as standard. We also can have panels made to fit the size of an existing panel which needs replacing, these will be made from stainless steel back box and front panel and will be vandal resistant. If you would like a free site visit to look at the full catalogue and choose the panel which is right for your premises please call and book an appointment. All of our systems come with two years guarantee and any faults caused by product failure will be fixed free of charge. If your requirements are for a larger site with multiple doors then we can offer many types of system but for easy installation and reliability we can offer a digital bus system which works on two wires. These systems are a solution when the client is working to a budget which cuts down costly wiring and time installing and commissioning or when wiring has become faulty and unreliable. For large sites we can fit access control systems that are fully controlled from your PC giving you full control over the site, also employe’s level of security and clearance to restricted areas. We can design the layout of the system to your requirements including mechanical code locks for low security doors, biometrics, door closers, mechanical locks or magnetic locks for controlled areas. We offer a full range of services, ranging from small residential to multi door, multi apartment buildings, and everything in between.We can offer you a no obligation quote now, so contact us for more information on 08005003013 or 07525249456. We can if required design and install a system to suit your budget and requirements. Also we can offer a package to suit the style of the site or property with a range of new and innovative products. All installations will add value to your property and if your thinking of selling your property they are an added selling point to prospective buyers. If you wish to install a state of the art intercom system or just looking to upgrade your existing system, look no further. We can provide video entry systems to suit your budget from low cost to crystal finished luxury video entry systems, a design and site analysis and client preferences will all be considered in designing a system that will be stylish and reliable for years to come, we can design the new system to be fully integrated with your existing security systems to bring greater security.